Drive-In Racking is used where high-density storage is required. It is frequently used in facilities with a low number of product lines. 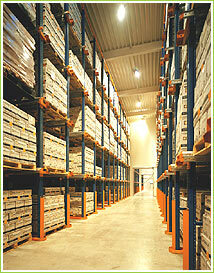 Pallets are stored in a block system with a reduced number of aisles. Forklifts drive into the racking to load or retrieve pallets, which are stored on cantilevered rails running throughout the system. The first pallet in is the last one out unless a Drive-Through system is used whereby pallets can be loaded or retrieved from either side.